The ocean covers almost three-quarters of the Earth, but how deep does it go? Put on your scuba gear and explore the ocean, from its shallowest waters to its deepest, most mysterious parts. As you dive deeper, you’ll discover glowing animals, strange creatures that don’t need sunlight to survive, and even the largest hunter in the world. With beautiful illustrations and engaging text, How Deep Is the Ocean? will guide young readers into the deepest parts of the ocean. 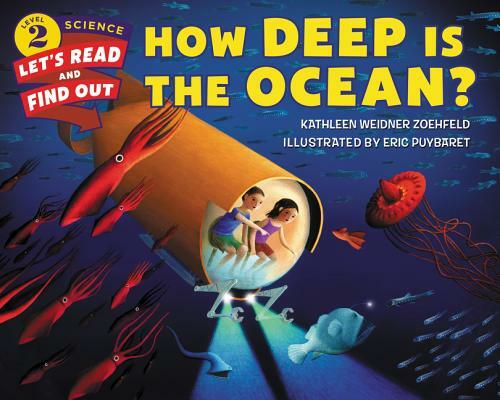 Featuring a find-out-more section with a water-pressure experiment, a lesson in making a sounding line to learn how scientists measure the depth of the ocean, a glossary of new terms, and web research prompts, this book will begin children’s explorations of the deep sea. Both the text and the artwork were vetted for accuracy by Dr. David Gruber, real-life deep sea explorer and professor of biology and environmental science at Baruch College. This is a Level 2 Let’s-Read-and-Find-Out Science title, which means the book explores more challenging concepts for children in the primary grades and supports the Common Core Learning Standards, Next Generation Science Standards, and the Science, Technology, Engineering, and Math (STEM) standards. Let’s-Read-and-Find-Out Science is the winner of the American Association for the Advancement of Science/Subaru Science Books & Films Prize for Outstanding Science Series. Kathleen was a children’s book editor for over ten years before becoming a full-time writer. When she is not reading, researching, writing, or editing she loves to spend her free time exploring, doing fieldwork, and preparing and curating fossils for her local natural history museums. She lives in Berkeley, CA.